Another reason is that I have more than one application that needs to be able to call these notes. I haven't made a secret of my love for DEVONthink Pro Office - well, I want to have an indexed folder that contains all of my tagged, plain-text notes readily available without having to manually import them, as I did with Evernote. Thirdly - I like having the control that comes with having all of my notes stored locally. Were Evernote ever to fold, I wouldn't want my data folding with them. So let me describe my new workflow to you. I've taken influences from such luminaries as Merlin Mann and the team at Asian Efficiency. The first decision I needed to make was how to capture quickly in OS X. I'd heard lots of recommendations on podcasts for an application by Brett Terpstra called nvALT. I thought I'd give it a try. I can see why it came so highly recommended. It has the same charm that Drafts has on iOS, in that the interface is beautifully simple. You either search for a note title in the search bar, or type a title in for a new document, press Enter and start typing. It's so simple. What I love about primarily about this application is the speed in which it runs. It's only dealing with plain text files, so searching is lightning quick compared with other applications that you may use. You can have ideas captured within seconds. If you truly want to capture those ideas as fast as possible, you will want to assign a hotkey. You can assign one in Preferences, however this requires the application to already be running. Instead, I have fused two hacks together to get nvALT opening at optimum speed. The first comes courtesy of Mr Terpstra again. I wrote recently about how reading one of his articles led me to modify the behaviour of my Caps Lock key. Now, when I press CAPS LOCK it Actually simulates a ⬆⌘⌥⌃ depression. The second part of the tweak comes courtesy of a simple Keyboard Maestro macro to open nvALT when ⬆⌘⌥⌃+N is pressed. Now it opens super-swiftly when I need to empty head. 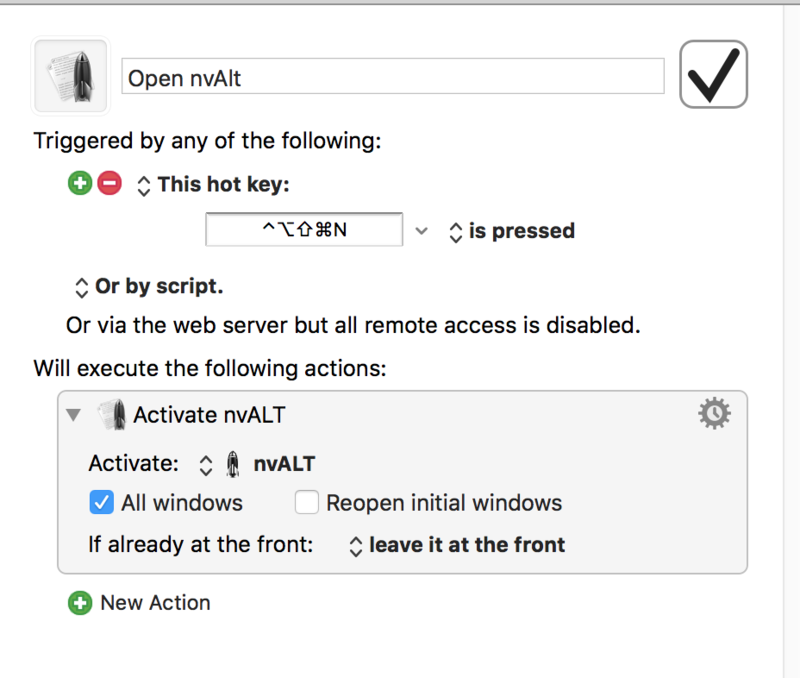 Using nvALT is great on OS X and solves part of my problem. What about iOS? You see, capturing notes on iOS hasn't really been an issue because by default, my go-to application has always been Drafts. Within Drafts, I would have actions set up that exported the Notes content to OmniFocus, Reminders, Evernote, DayOne or any other application I wanted. I needed to get nvALT and Drafts talking, and this was achieved using Dropbox. The first stage here was to configure nvALT to store the plain text note files in Dropbox. This was easy, I opened Preferences and changed the target location of the read notes from folder section to a Dropbox folder of my choosing. I then clicked the dropdown on Store and read notes on disk as and changed the value to plain text files. That sorted the synchronisation on OS X. Now I needed to go to Drafts and configure an action that would send text notes to that Dropbox folder. This was as simple as taking the existing Dropbox action that comes pre-loaded into Drafts, copying it and changing the path to point to my nvALT save location. I said earlier that I needed a system that helped integrate my notes into DEVONthink. You see, one headache I used to have concerned which application should I use for certain notes. If it was about a certain project, surely I should only use DEVONthink Pro Office for that? Or should I use Evernote because it's only a short note? What about family notes, where should they go? This was all thinking time that I wanted to eradicate. So I did. Everything, large or small, personal or note - EVERY plain text note is created with nvALT. I'm able to achieve this by using a combination of indexing and tags, although this can be made more complicated if you so wish by leveraging Hazel. Firstly, I added my nvALT Dropbox folder as an index location (for more information on Indexing with DEVONthink, click here for a walkthrough. I then created a Smart Group that only displayed results containing my clients tag. As I make notes in nvALT, I'm careful to ensure I tag each note appropriately - this then allows for me to really leverage Smart Groups in DEVONthink. If I want to create a note within this indexed folder from DEVONthink itself, this is achievable too. It won't synchronise across automatically, instead you have to highlight the file and select Move To External Folder. This isn't too onorous and, in truth, doesn't really apply too often as I'm far to quick with the ⬆⌘⌥⌃+N trick! So there is my workflow as it stands. I've been using it for a couple of weeks so far and it seems to be holding up well. I haven't come across many stumbling blocks at the moment and I'm proud to be able to say that all my notes are in plain text and in my own control. Now sharing notes with my family, that's another ball-game altogether. I'm looking forward to solving that particular one!